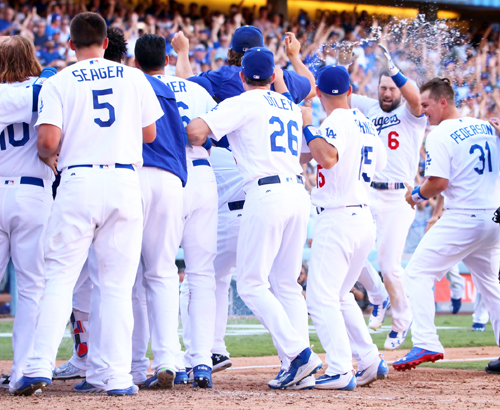 “I am terribly embarrassed,” Scully told following the Los Angeles Dodgers 4-3 victory 10-inning over the Colorado Rockies that assured them of their fourth consecutive National League West Division championship. “I was hoping that we would win the game 10-0 and there would be no tension and it would be a nice, easy day because I have a very, very small modest contribution on my last day,” Scully told the crowd announced at 51,962. After the crowd cheered, the recording played, while Scully had his left arm around his wife Sandra. Dodger batters tipped their helmets to Scully before their first at-bats and several of his grandchildren visited him in the broadcast booth. Charlie Culberson’s first homer of the season broke a tie with two outs in the bottom of the 10th inning. 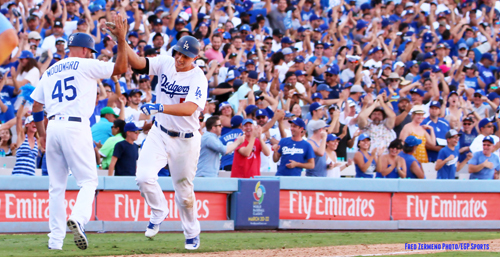 The Dodgers tied the score when Corey Seager hit a solo home run with two outs in the bottom of the ninth. Colorado had taken a 3-2 lead in the top of the ninth inning when David Dahl hit a solo homer with two outs on a 1-2 pitch from relief ace Kenley Jansen. The 88-year-old Scully has said his final game will be next Sunday, when the Dodgers will be playing in San Francisco, because it comes 80 years to the day when he saw a sign at a laundry in his native New York City reporting the score of Game 2 of the World Series that day — New York Yankees 18, New York Giants 4, that prompted him to become a baseball fan. “It seems like the plan was laid out for me, and all I had to do was follow the instructions,” Scully said. 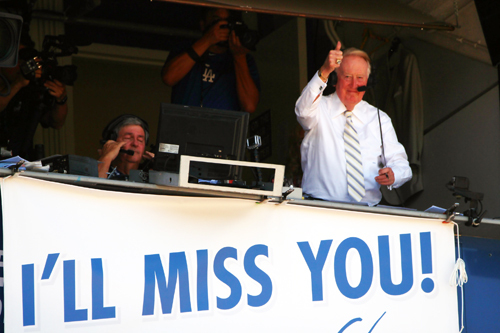 Scully’s 67 seasons with the Dodgers is the longest tenure for a broadcaster with a team. He has been the Dodgers’ No. 1 broadcaster since 1954. 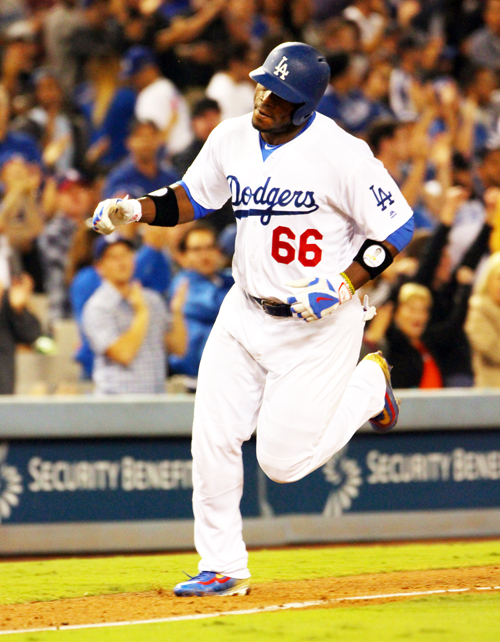 The Los Angeles Dodgers stayed hot as did Yasiel Puig since his return to the Dodgers, with a pair of RBIs and his 9th homerun to key a 3-1 win over the D-backs Wednesday at Dodger Stadium. 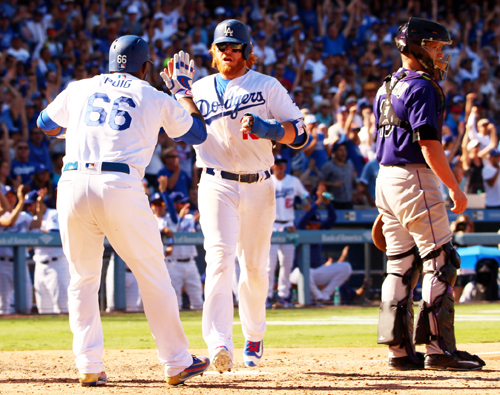 The win gave L.A. a sweep over Arizona, five straight wins and a season-high five-game lead over the Giants in the National League West. Rookie sensation from Japan, Kenta Maeda with a (3-0) start, lowered his league-leading ERA to 0.36. Even though he has six seasons as a pro in Japan, he is a rookie in America. Maeda tied a Major League Baseball record during the Dodgers 4-1 win over Colorado on Saturday. He also pitched 6 1/3 scoreless innings Saturday and has allowed just one run through his first four career starts, tying for the fewest in the majors during that time frame since 1900. The 28-year-old Japanese pitcher also struck out eight batters against the Rockies, bringing his season total to 23 in 25 1/3 innings. The Dodgers are at home this weekend against the San Diego Padres. A fireworks display will take place after the game on Friday. A street leading into Dodger Stadium will be named after the team’s longtime play-by-play announcer Vin Scully, who plans to retire after 67 seasons with the Dodgers. “Now we’re going to say, ‘Hey, go up Sunset and make a right on Scully Avenue’ – that’s going to be the new directions to get to Dodger Stadium,” said Councilman Gil Cedillo, who proposed the street name change. 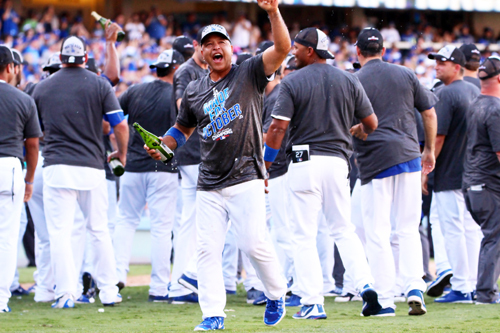 Dodger manager Dave Roberts told the council that “on behalf of the players, the organization, we’re deeply honored, as Vin has called many great monumental moments” in Dodger history. Former Dodger stars Orel Hershiser, Maury Wills and others were on hand for the vote, as were several active players. The 88-year-old Bronx-born Scully has announced Dodger games since 1950, when the team played in Brooklyn. He said in August that the 2016 season likely will be his last. Scully has been an announcer longer than anyone else in sports history. When Mayor Eric Garcetti made a similar street-naming proposal in 2013 in response to a viewer question on a public affairs television program, Scully said he would prefer for a street near Dodger Stadium to be renamed after Walter O’Malley, who brought the team to Los Angeles from Brooklyn, or his son Peter, instead of himself. Peter O’Malley succeeded his father as the team’s chairman of the board upon the elder O’Malley’s death in 1979. The O’Malley family continued to own the Dodgers until their sale to the Fox Group in 1997. It’s the Dodgers versus the Mets in the National League Division Series, and the Los Angeles and New York police chiefs are betting some serious meat on the matchup. Los Angeles Police Chief Charlie Beck and his predecessor, New York Police Commissioner Bill Bratton, announced a wager Wednesday, with the winner getting a free deli meal, most likely pastrami. If the Dodgers win, Bratton will treat Beck to lunch at New York’s famed Katz’s Deli. If the Mets win, Beck will be picking up the tab for lunch at Langer’s Deli in Los Angeles. 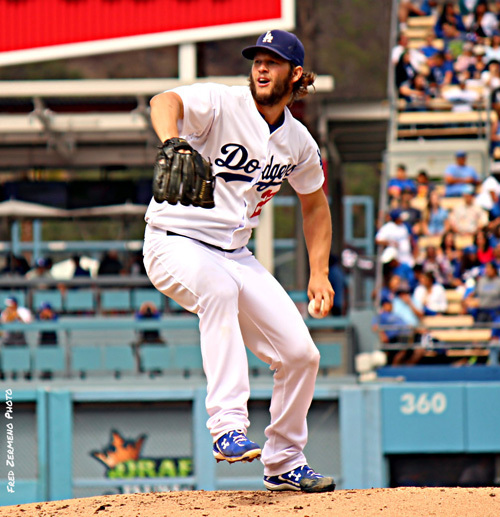 Clayton Kershaw will be the starting pitcher Friday for game one of the NLD series at Chavez Ravine. On Sunday, he added another accomplishment to his already impressive resume, recording his 300th strikeout of the season in the third inning of the Dodgers’ 6-3 win over the Padres. He’s the only major league player to reach the strikeout milestone since 2002. 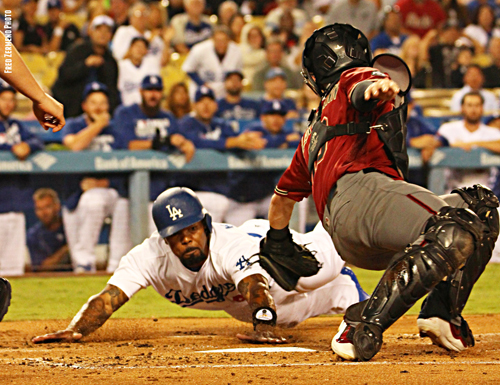 The Los Angeles Dodgers will play their 2016 home opener April 12 against the Arizona Diamondbacks, according to the preliminary schedule announced Tuesday by Major League Baseball. 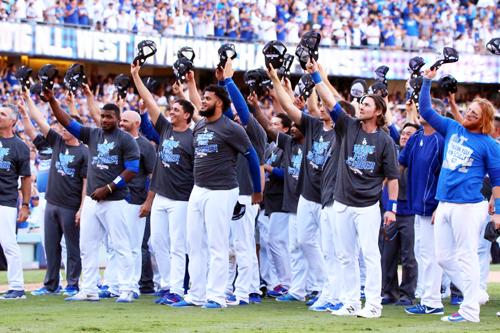 The Dodgers will open the season April 4 at San Diego. The 81-game home schedule includes 10 interleague games, May 16-17 against the Los Angeles Angels of Anaheim; July 4-6 against the Baltimore Orioles, the Dodgers’ opponent in the 1966 World Series; July 26-27 against the Tampa Bay Rays; and Aug. 5-7 against the Boston Red Sox. The Dodgers will play home games on Jackie Robinson Day (April 15 against the San Francisco Giants), Father’s Day (June 19 against Milwaukee), Independence Day (July 4 against Baltimore) and Labor Day (Sept. 5 against Arizona).